Wound Care is important especially for seniors. It can help prevent infection and further complications in health. 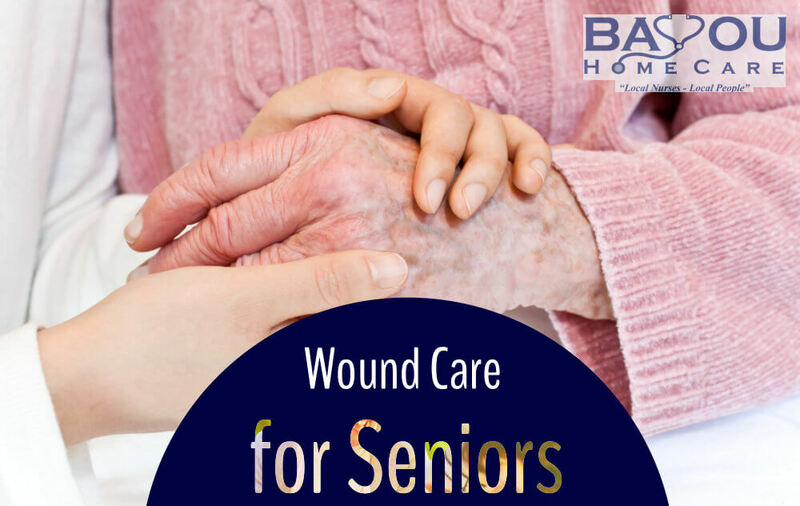 Here at Bayou Home Care in Louisiana, we provide Certified Wound Care services to give your loved ones professional wound care. However, when emergency situations arise, it is best to know even just the basics of wound care for acute wounds. Acute wounds are injuries that only occur on the skin. It happens when the skin is punctured, cut, or irritated/ruptured. Bleeding is often the clearest sign of an acute wound although swelling and pain can be signs as well if bleeding doesn’t occur. Here are simple steps you can do to treat acute wounds. Control the bleeding. If bleeding occurs, it is important to stop and control the bleeding to avoid too much blood loss. This can help prevent further complications from happening. Apply pressure on the wound using clean cloth and wait until the bleeding stops. Clean the wound. Once the bleeding has stopped, use soap or perhaps saline solution to clean the wound and the area surrounding it. Clean the wound thoroughly and rinse it thoroughly as well but don’t rub it too much. Be as gentle as you can to avoid worsening the condition of the wound. Doing this can help prevent infection and also prevent damage on the blood vessels, nerves, and muscles. Dress the wound. Prevent further exposure from bacteria and infection by closing and dressing the wound. If you have a first-aid kit on hand, you may use a gauze or Band-Aid for this. If this is not available, you can close the wound with a clean piece of cloth. Get professional medical help. After basic wound care, the wound must be assessed by professionals in order for proper treatment to be administered. Follow the physician’s instructions religiously and take the prescribed medication regularly. Here at Bayou Home Care in Louisiana, we have Certified Wound Care Nurses to make sure that your loved ones are taken care of in the best way when sudden injuries occur. If you want to make sure that your loved one gets the best all-around health care, then choose Bayou Home Care in Louisiana! We specialize in services such as Certified Wound Care Nurses, Skilled Nursing, Physical Therapy, Occupational Therapy, and Speech Therapy among many others. We here at Bayou Home Care in Louisiana have been serving Southeast Louisiana by restoring quality of Life, providing care at the comfort of home and many more. You can visit any of our locations in Pierre Part, Houma, Metairie, Denham Springs/Baton Rouge, and Morgan City. Know more about us by visiting our site at bayouhomecare.com. This entry was posted in Home Care, Home Health Care and tagged home health, respite care, senior care, wound care. Bookmark the permalink.